Girly Bits' collection for fall is inspired by one of my favorite things: television! Pam took inspiration from three of her favorite TV shows for her Fall Season Premiere Collection and created three gorgeous shades to represent each of them. 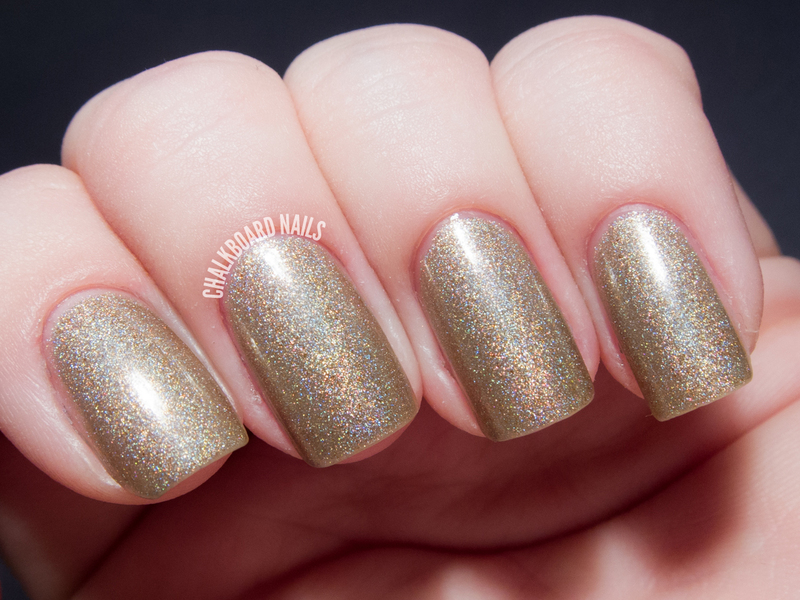 Holo lovers, take note: six of them are holographic! The first show represented in this collection is Bones! I recently got into this show and eagerly gobbled up everything Netflix had to offer... I'm currently working my way through the new episodes they've just added. 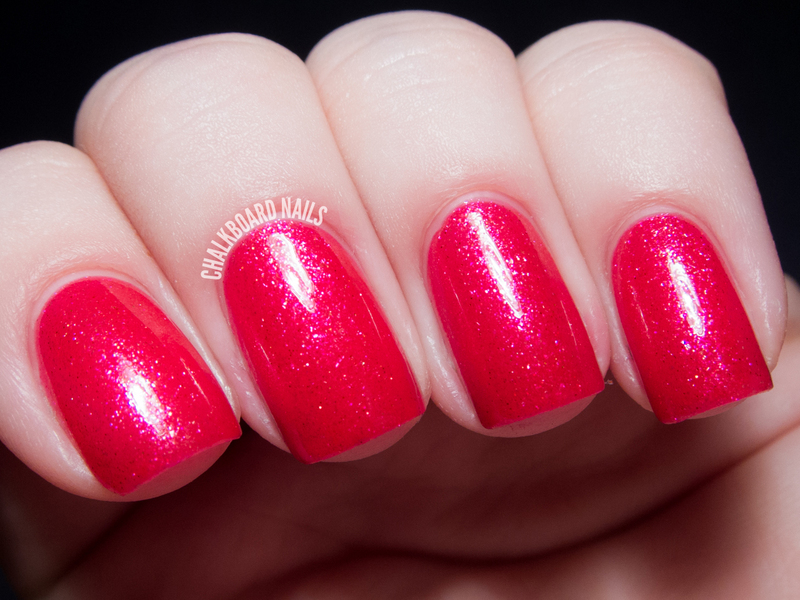 Dancing Phalanges is a gorgeous pink-toned red with pink glass fleck shimmer. The shimmer is visible in all lights! I used three coats for maximum vibrance and squishability. Gravedigger is a bruised black jelly with Halloween colored glitters. I was super impressed by the formula on this; the glitter didn't clump at all and the jelly applied smoothly and evenly. Three coats. King of the Lab is a pumpkin orange with gold glass flecks. 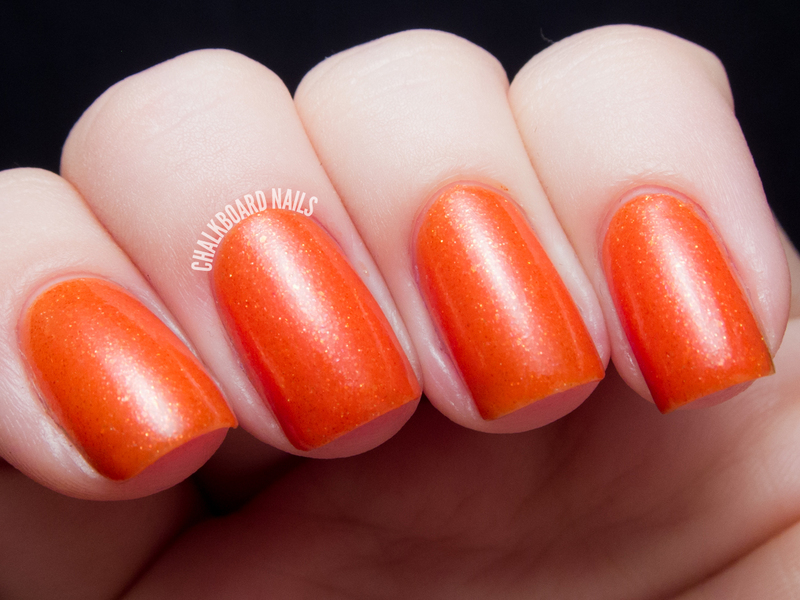 A beautiful orange, for sure, and it applied evenly. Three coats shown. 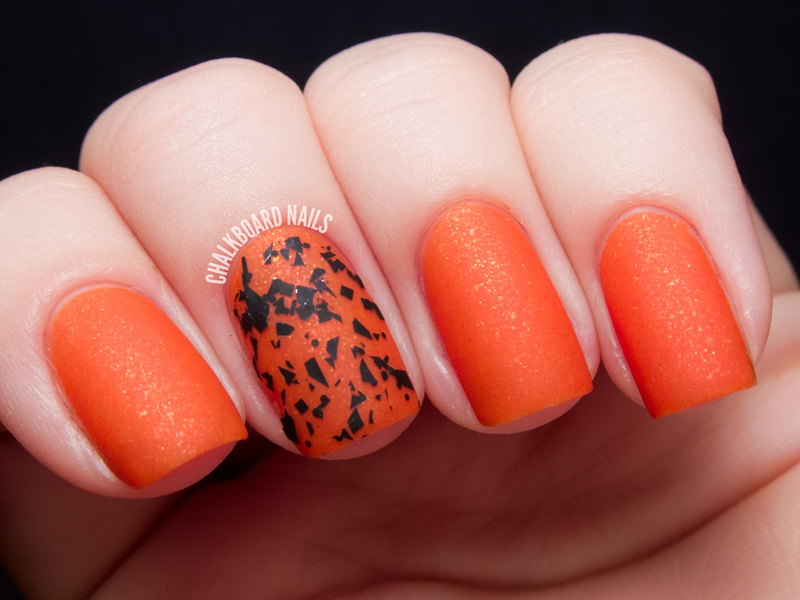 I wore this one as a full manicure after swatching and paired it with OPI Matte Topcoat and Cirque Neko. Unfortunately Neko was an LE from last year but Cirque Vectors from the new collection would have a similar effect. While I've never been a huge fan of Family Guy, I have to say the shades it inspired are great! These bright and sparkly shades are sure to put a smile on your face, too. 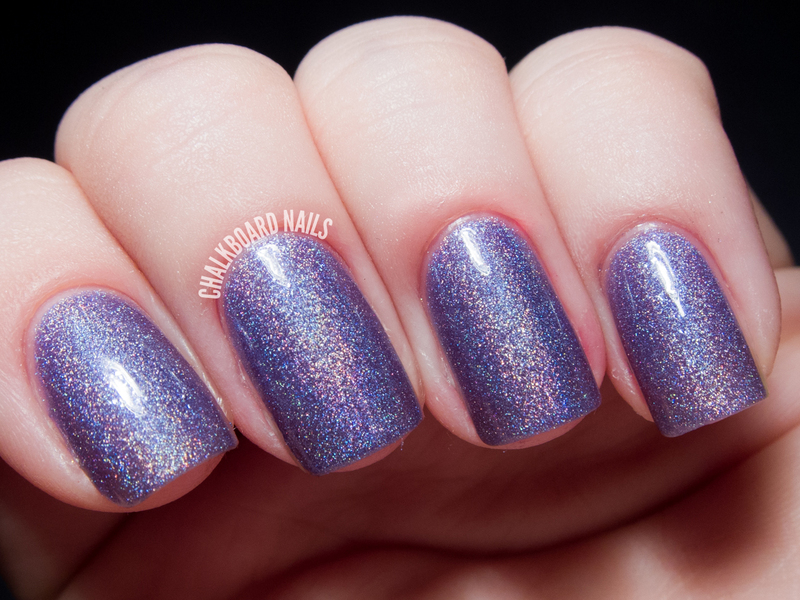 Bird is the Word is a pinky-purple holo shimmer. This one is less linear than the other two in this collection but packs a punch with glints and flashes of pink and gold shimmer. Three coats. Giggity Giggity Goo is a champagne holographic. 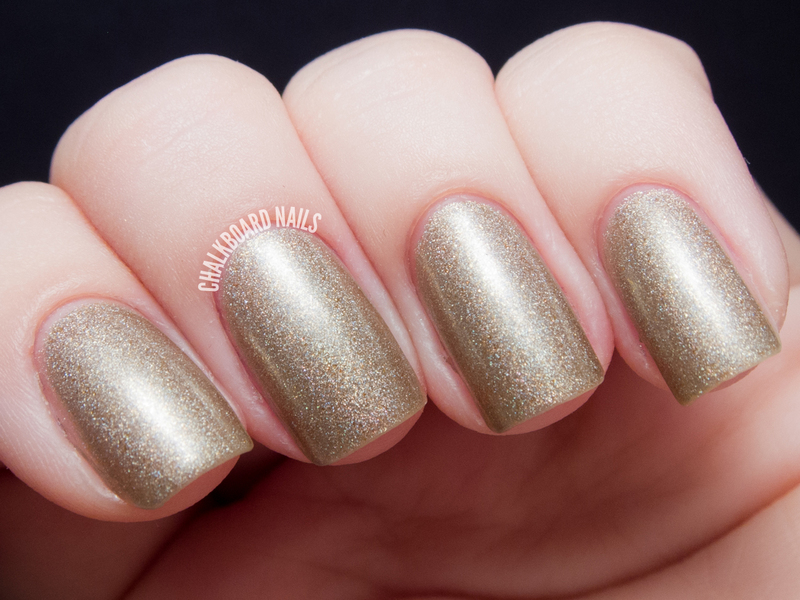 A perfect pale gold, this shade is perfect for the holidays! Three coats. What the Deuce? is a cheerful kelly green holographic. Three coats. Some naysayers may claim that SNL has lost its touch in recent years, but I still enjoy watching it! It's true that I miss fan favorites like Kristen Wiig, but I think the new cast has potential. There are three SNL inspired polishes in the Fall Season Premiere collection -- all holos with a little somethin' somethin' extra! 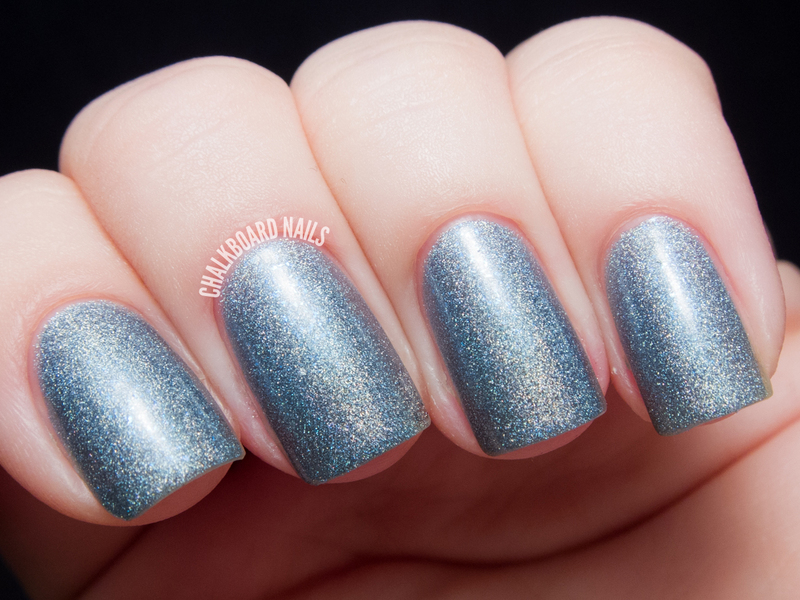 D!ck In a Box is a charcoal holo with a coarse linear holographic effect. This polish has flashes of pink flecks that, of course, didn't show up in my photos. I'm fairly certain I used 2 coats for this one. More Cowbell is named for my favorite SNL skit ever. I've got a fever, and the only prescription... is more cowbell! This one has a flash of color similar to D!ck In a Box, except Cowbell's flash is blue. Again, it did not want to show up in my photos. Rude. ;) Three coats here. Well Isn't That Special is a medium purple with white flakes. You can see the flakes best in the second photo - try looking right in the middle of the highlight on my nail. This is three coats. I wore this one for five days straight with zero chipping. Impressive! PHEW! That was a lot of television to get through (just like my DVR)! What do you think? Which ones are your favorites? If you could make a polish collection based on a TV show, what would you pick? Overall, I was super impressed with all of these. Great formulas, great colors, wonderful wide brushes, what more could a girl ask for? You can shop this collection via GirlyBitsCosmetics.com or browse Girly Bits stockists. Keep up with the brand on Facebook, Twitter, and Instagram for new release info, specials, and more. I love the Bones polishes, because I love the show. It's one of my favorites. The SNL collection is my favorite but What The Deuce is right up there! And I love that you said squishability. Haha of course! Such a funny video. 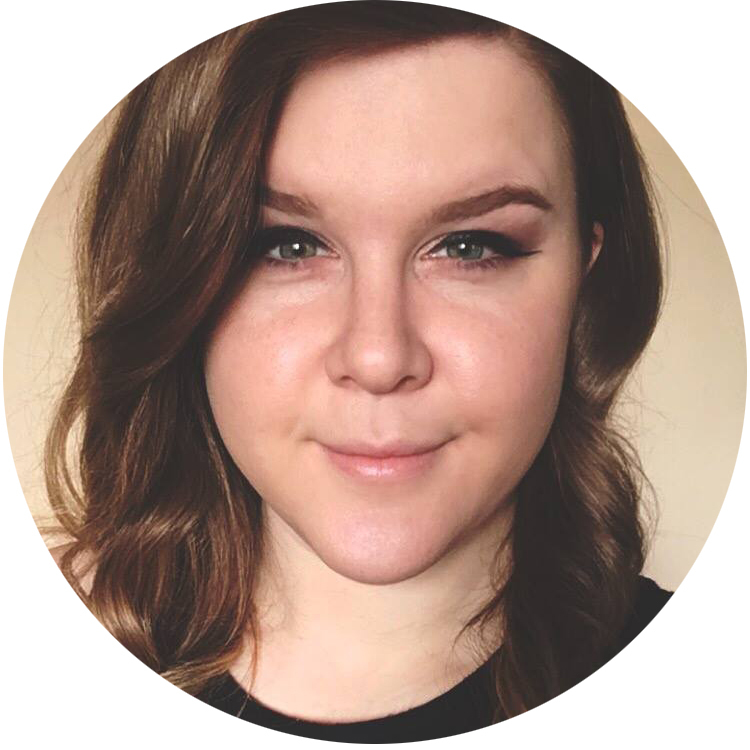 :) I agree, indies always have that personal connection and "something extra." Squishability -- totally a word! It's so good. I love every character on that show! D!ck in a Box is my favourite of the collection, in colour and name. Dancing Phalanges is my second favourite in name. My daughter cringed when I told her I was naming one D!ck in a Box, but I just HAD to. I LOVE JT on SNL. My favourite host ever, and among my favourite skits. More Cowbell is also one of my all time favourite skits. I am so in love with those characters. The chemistry on that show is perfect. I was very happy with how the polishes represent the characters. What a creative collection! I love all of the shades actually, but my favorites are Well Isn't That Special and Giggity Giggity Goo. These are so much fun! I think my favorite is Gravedigger :). Maybe next collection could include Schweddy Balls. :) An inside joke with my family is to tell someone, "Your phalanges are showing". So of course that's another winner for me. The SNL inspirations are endless. Schweddy Balls actually came up! Along with Mother Lover.